One of the richest heritages left to us by the last quarter of the century, so recently closed, is the provision for special training in every department of woman's work. The benefits arising from this provision are already so widespread that one feels justified in speaking of the movement as a great and regenerating one. Into this movement the Church has entered with sympathy. 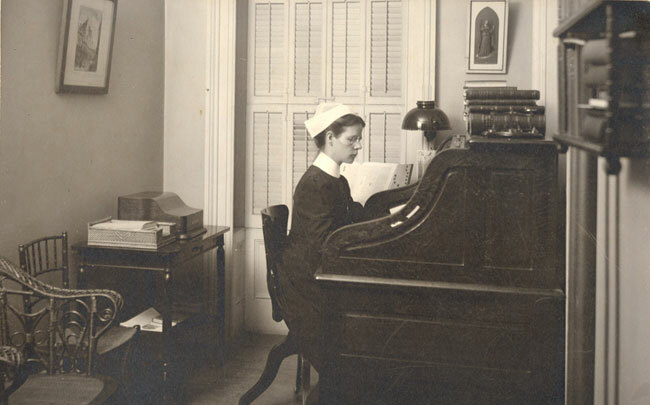 Her instructors in day schools must be college graduates; her nurses must possess the diplomas of an approved hospital; her clergy are desiring more and more to be assisted by deaconesses who have been both technically and religiously trained; her missionaries [1/2] must be grounded and tested in a manner approved by the Board of Missions. Even her Sunday-school teachers are beginning to be looked over anxiously, to the great encouragement of those who know a thing or two about the inner working of a Sunday-school. First: The school which gives the training. Second: The woman who receives the training. Third: The work of the trained woman in home and distant fields. Almost immediately upon the passing of the Canon entitled "Of Deaconesses" by the convention of 1889, the schools in New York and Philadelphia were founded. Since then a third school has been opened in St. Paul. These schools, though founded originally for the training of deaconesses who were destined to assist the clergy in [2/3] parochial and institutional work, have become the training schools for foreign missionaries as well. It is most desirable, for many reasons, that the same institution should receive within its walls candidates for both these spheres. The candidate for the mission field learns in many cases to desire the office that entrusts her with the authority of an order of the Church. The candidate for that office, who has entered the school with a readiness to cast in her lot with her sisters among the poor of her city, learns often, while she is quietly preparing, an equal readiness to cast in her lot with her sisters in Asia or the Islands of the Sea. If we turn to the Church of England, as to the mother Church who has been training missionaries many more years than has our own, we find her great Missionary Societies turning naturally to Deaconess Houses for co-operation in training. The Church Missionary Society and Mildmay work hand in hand, and of late the Society for the Propagation of the Gospel has used the Deaconess Community [3/4] House in Portsmouth for the same purpose. But to return to our own schools. The course of training covers a period of two years, with an adapted course of one year required of the candidate for the mission field when she is not seeking to be a deaconess, and is not able to take the full course. This expedient is not in favor with the school authorities, however, and is rarely put in practice. The course provided in each school may vary somewhat in detail, the relation between the practical, the scholastic and the devotional being adjusted according to the judgment of those in authority; but, be that as it may, I think we may be said to possess a single aim, which is to send to the overshadowed members of the human family women possessing the trained mind, the tender heart and the efficient hand. The question is often put to one, why so much scholastic training is thought necessary. It is necessary, first, for the woman herself. She becomes among educated gentlewomen a woman with an additional fund of knowledge that [4/5] makes her both more interesting and more influential. It is no less valuable to her in all her work among the poor. The intellectual impetus, the disciplined mind, are with her in every situation she faces, and her poise is firmer in consequence. Second: The woman who receives the training. What are the qualifications expected of her if she is to enter the school? In treating of this part of my subject, what is said must be drawn from the standards of the New York school, with which I am identified, but if this does not reflect with complete accuracy the standards of the sister schools, still I believe there will be nothing said contrary to them. An applicant for the foreign field is investigated by the Board of Missions. If the Board is satisfied, we admit to the three months' probation on their recommendation. If the woman applies directly to the school as a candidate for the diaconate, every available means is used by the dean or the committee on admissions, as the case may be, to gain information about her, both as to her character and [5/6] her ability. She must be well endorsed by a clergyman, and a physician, and if she does not possess the diploma of a college or approved school she is required to pass an entrance examination. That the woman who enters the school should be gifted is most desirable, that she should be industrious is a clear necessity; the course required is successfully accomplished only by the industrious and persevering; but the indispensable requirements, for either a deaconess or missionary, are first, the spirit of consecration, and second, the spirit of harmony. Without the first, no woman understanding herself would assume such a life and work, without the second, no woman in such a life and work could hope for success. Three: The work of the trained woman in home and distant fields. May we not leave this division of our subject to be illustrated by the woman herself? We find her here in Washington, in New York, Philadelphia, Boston, Cincinnati, Pittsburg and many another city of our land, where she is quietly and happily ministering to [6/7] the poor, teaching in parish and choir school, or presiding over an institution. We find her in Western State and Territory, in Alaska, Mexico and Brazil, and when we cross to Asia there we find her also--in China, Japan, or the Philippine Islands. We are encouraged at our growth; we are filled with ambition for our schools. We are conscious of our defects, also, and to be brought face to face in this way with you, my sisters, prompts me now in closing to ask your help. Will you not enrich our schools with your deep and sympathetic interest and your prayers?